After the release of the BLE Mesh protocol by Bluetooth SIG, Espressif’s Bluetooth-Low-Energy team swiftly began planning the development of the ESP BLE Mesh SDK. 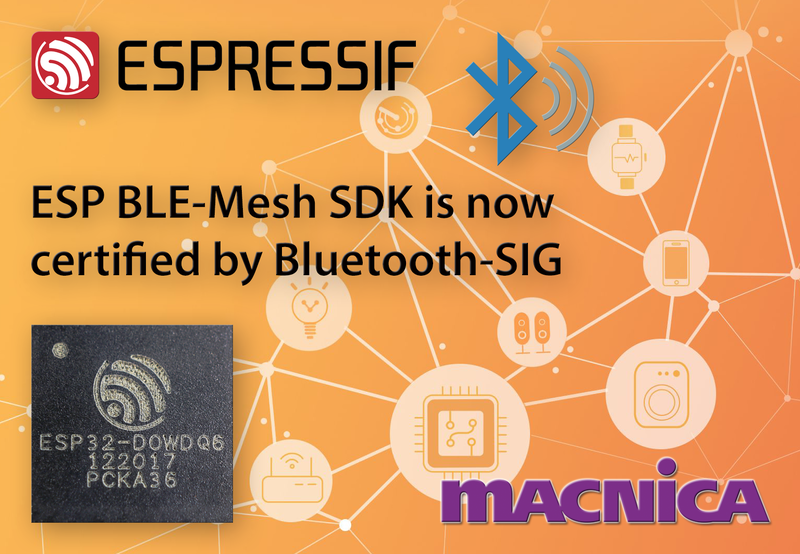 After over a year of research, not only can Espressif’s implementation of the Bluetooth Mesh support BLE-Mesh-related applications, but it has also been granted the official Bluetooth SIG certification, previously known as BQB. In November 2018 Espressif created a temporary BLE Mesh branch in its official IoT Development Framework for ESP32. The purpose of doing this was to give the opportunity to developers from around the world to take a look at it and provide feedback, while the later version was still being prepared. Sharing our code and our latest developments with the community is a standardized practice at Espressif. Our constant interaction with the community gives us the opportunity to realize and fix any issues developers might have when using our development framework, before each new version of it is officially released. We believe that this level of transparency ultimately works for the benefit of everyone. Espressif’s BLE Mesh SDK is built on top of the Zephyr BLE Mesh SDK. Zephyr is a collaborative project hosted by The Linux Foundation, with more than 400 world-wide developers using it for their own projects, which provides a very solid basis for Espressif to further develop the SDK. The temporary BLE Mesh branch is still in use and supports the BLE-Mesh-enabled provisioner or node, along with segmentation of the mesh network, as well relay and proxy, and a range of generic client models such as lighting and sensors. New features will be added to ESP BLE Mesh, such as Low Power Node, Friend Node and NVS (Non-volatile storage). Also, fast network provisioning, Wi-Fi & BLE Mesh coexistence performance and rapid OTA update will be further optimized. In particular, the Fast Provisioning Model has speeded up the network provisioning process, with 100 nodes being network-provisioned within 50 seconds during our demo test. Like BLE Mesh, Espressif’s Wi-Fi Mesh has always been considered user-friendly by developers using it in their Mesh application development. The table below provides a comparison between the features of Espressif’s Wi-Fi Mesh and BLE Mesh. Espressif Systems (Shanghai) Pte. Ltd. is a fabless semiconductor company, with headquarters in Shanghai Zhangjiang High-Tech Park, providing low power Wi-Fi and Bluetooth SoCs and wireless solutions for the Internet of Things (IoT). The company build the widely popular ESP8266 and ESP32 chips with an innovative team of chip-design specialists, software and firmware developers and marketers. Espressif is committed to providing the best IoT devices and software platforms in industry. The company also helps their customers build their own solutions and connect with other partners in the IoT ecosystem. Their passion lies in creating state-of-the-art chipsets and enabling partners to deliver great products. Espressif’s products are widely deployed in the tablet, OTT boxes, cameras, and Internet of Things markets. For more information, please visit http://www.espressif.com.